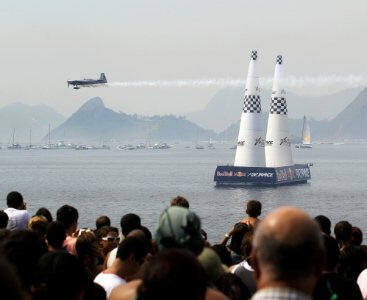 May 9, 2010 - Hannes Arch of Austria came from behind to beat Nigel Lamb of Britain in dramatic fashion on Saturday to win one vital championship point with the fastest Qualifying time at the Red Bull Air Race in Rio de Janeiro in front of a record qualifying-day crowd of 400,000. Britain’s Paul Bonhomme, who still leads the overall championship, was a disappointing third on the high-speed, low-altitude 5,634-metre race track set up in front of Rio’s Flamengo Beach. Arch, who was in second place behind Lamb after the first of two Qualifying runs ahead of Sunday’s race, opened the throttle on his second run under brilliant blue skies and tropical temperatures. Although afternoon sea breezes were slowing down most of the pilots, the Austrian managed to shave nearly a second off his earlier time to deny Lamb the one point awarded to the fastest qualifier. Arch stopped the clock in 1:20.44, 0.73 ahead of Lamb and 1.18 ahead of Bonhomme. The defending champion, Bonhomme, still leads the championship with 22 points with Lamb (18) in second and Arch (15) alone in third. An even bigger crowd of up to one million is expected for the race on Sunday. There was a crowd of one million at the first race here in 2007. “I'm pleased I was able to raise my game today. We need every point to catch up with Paul. The engine works great and my team is working great. I'm really motivated for tomorrow,” said Arch. Australia’s Matt Hall took a promising fourth place in Qualifying, just 1.54 behind Arch, while American Kirby Chambliss (5th), Frenchman Nicolas Ivanoff (6th), Canada’s Pete McLeod (7th) and American Michael Goulian (8th) were all within striking range of a podium on Sunday with less than 3.5 seconds separating the leaders. The enormous home crowd cheered heartily for Michael Goulian, who was flying in Brazilian colours after signing a sponsorship agreement with Brazilian energy company Petrobras. It was a disappointing afternoon in Brazil for Russia’s Sergey Rakhmanin (11th), Hungary’s Peter Besenyei (12th), Japan’s Yoshi Muroya (13th) and Martin Sonka of the Czech Republic (14th). They failed to qualify for spots in Sunday’s final but will get a second chance to win the final two spots in the Wild Card competition early on Sunday. The weekend’s race in Rio is the second consecutive race this year in the Southern Hemisphere, the first time in Red Bull Air Race history that there have been back-to-back races south of the equator and a reflection of the growing popularity of the high-speed, low altitude sport around the world. Brazilian rookie Adilson Kindlemann will only be a spectator after his plane was wrecked in an accident in Perth.